Yes, that's right! Beard Terminology is a thing. Growing a beard is a simple thing. It's natural and a beautiful thing, but getting the terminology nailed is key if you want to get the most out of your beard. I mean if you're looking to join the community, then you got to speak the language! "You going for your yeard mate?" or "Nice bum fluff geezer". What do all these mean?! Well, that's what I'm here for! I've started this article to give you all the information on beard terms and common beard slang words. I'm planning on keeping this open to suggestions and will aim to keep this updated as new trending terms arise. Here is my top 47 list of beard terms you need to know. Beard Balm is a product that is used in your everyday beard regime. It's a product that is mainly made up of Beeswax, butter (Shea Butter) and carrier oils. It is typically used for conditioning your beard, and also great for styling your beard and giving you that hold. Balms also have essential oils mixed and tend to come in a number different scents to keep you smelling like a champ. The barber is a professional tradesman that you pay to cut your hair. Any real man should always use a barber and never set foot in a salon or a hairdresser. I mean the best thing about the barber is the Banta! Beard is the hair that grows in certain areas of the face, this would include your cheeks, chin and neck and also the hair around the bottom of your lips. Everyone needs to own a boar bristle brush. This brush has a number of benefits such as promoting healthy hair growth, adds shine, cleans the beard hair and prevents breakage and frizz. The Boar bristles are soft and they gently massage the skin under your beard, increasing blood flow and cleaning hair follicles. Very similar to a beard balm, beard butter is usually a product without any wax, so they tend to have more different types of butter in there e.g. Mango Butter, Shea Butter, Cocoa Butter etc. Because of the high content of butter, this product is great for a full leave-in conditioner for your beard. It's great for night time as an alternative to beard oil. The cheek line is the line that defines the upper growth limit of your beard hair at the top of your cheek. When we talk about a 'Good' or 'Bad' cheek line, we refer to the area that is trimmed below or above a so-called cheek line that runs from the top corner of your moustache, and the top of your sideburn. 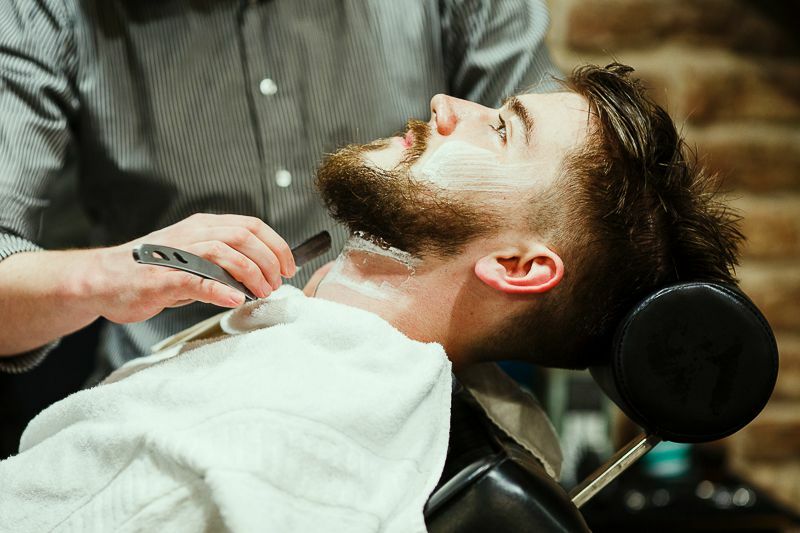 When you take a trip to the barber, you would normally use something called clippers, which is a tool for trimming the hair either on your beard or around your neck or cheek line. Clippers are a traditional barber trade tool, that is normally used for long hair on the head, but can be used for your beard. Alternatively, for your beard, you would normally use a beard trimmer which is a smaller version but does pretty much the same job. An alternative to having a beard brush, most lads go for a beard comb. You can get beard combs in all sorts of styles to suit your beard. If you have a short softer beard, a standard small beard comb can be good for training your beard to grow in the way you want it to. 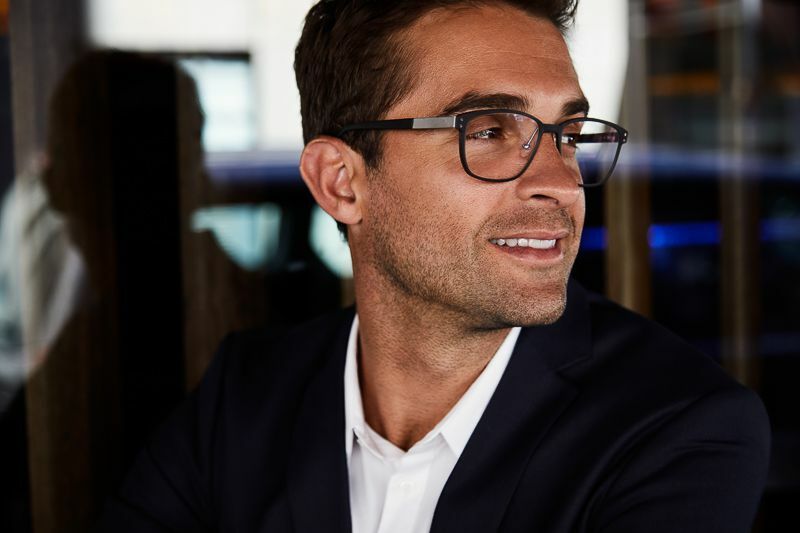 If you have a longer more wiry beard, then you can go for a wide tooth comb, or even a beard pick to help train and keep your beard looking neat and tidy. The configuration of your beard is all about how the hair that makes up your beard sits around your face. The configuration can be altered by grooming your beard and moustache by trimming or shaving areas of your beard and face. Alternatively, the hair could be left alone which would give you what is called a natural configuration. The first time you have this, it's some scary shi#! I would recommend you getting this done at a barber before you try and do it yourself. This form of shaving is literal taking of a knife like-blade to the throat. Yikes! This is a shave technique that you see with most villains in a movie. It's completely badass! Some people say it is the ultimate display of trust. Beard dandruff is a thing. Just like the hair on your head, your beard can develop beard dandruff. The main cause is dry skin. 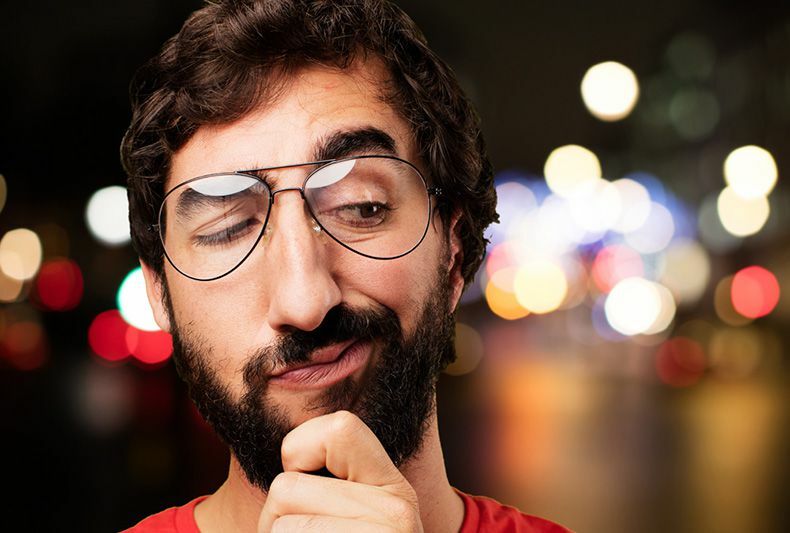 There are a number of reasons why beard dandruff can develop - poor conditioning, cleaning your beard too much, or even skin conditions and irritations. Dandruff is normally seen as flaky skin and can make your beard look like sh##. In terms of beard and moustache, density is a measure of the thickness and the fullness of your beard or moustache. It's usually measured by the number of terminal hairs per square centimetre. when your beard is mentioned as high-density, this means that it's thick. This beard style is a long beard divided into two lengthy tines. Basically a pronounced fork at the top of the beard. You might think this is a weird one, but it's not just women that need to exfoliate, men need to do it too. Us men can benefit more from exfoliation than women as we have thicker skin and more sh## in our pores. Exfoliating removes dead skin cells, opens up your pores and just makes your skin look better which will further enhance your beard look. Facial hair is, well, basically a term that describes all the hair that grows on your face. This would obviously include your beard and moustache, but also your sideburns, eyebrows and eyelashes. When we talk about facial hair here, we're mostly using it as a general term to describe our beards and moustache hair. After you've shaved in the morning, the Five o’ Clock Shadow refers to the slight hair growth you get on your face in the afternoon. The full beard is the most common and popular beard style. It's achieved by growing all the components of your facial hair (excluded your eyebrows and lashes), so this includes growing your sideburns, front hair, cheeks, around your mouth, lips and chin. A style of facial hair achieved by growing only the beard on the front of and sometimes below the chin. The moustache is frequently grown to accompany the goatee. Also known as a permanent beard or a Terminal beard. This type of beard is normally left untouched, basically until it can't naturally grow any further. What normally happens when beards finally reach their longest point, is that you'll start to develop split ends and the hair will start to fall out, this is what we mean by a terminal beard or the Grandfather. Everyone is different, so your terminal beard might look completely different from mine. If you fancy that cool Gandalf beard look, then this is the one for you. By far my favourite style. It's the one style that I rock the most. This style of moustache is where you grow out your moustache, and train it by brushing it outwards. You then develop long hairs at the end which can then be twisted up to look like handlebars. There are a wide number of beard styles that are considered a Hipster beard. 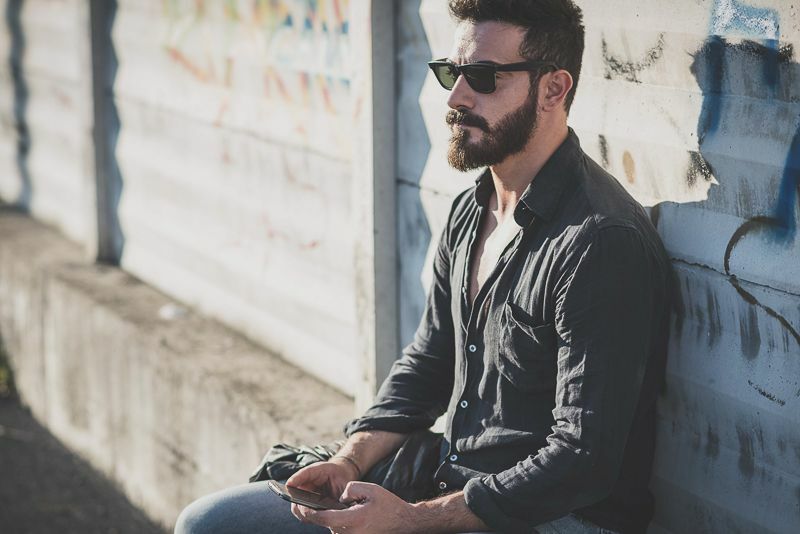 This style is mainly a general name for cool full looking beards that are mainly associated with stylish people (Hipsters). This is a style of moustache that was very popular back in the day. I mean my dad had this for years!! The Horseshoe is where your moustache grows in the shape of a horseshoe. So the ends of the moustache go down to the jawline. Lads, ladies don't dig this style anymore. I'll advise against it unless you're doing it for charity or something for Movember. You don't see this that often these days, but it was massive in the 1970s. I mean there isn't a family photo in my house where I don't see my grandad rocking these bad boys. Lamb chops, or Mutton Chops were sideburns that were grown out very BIG! Hence the name, lamb chops. What we call the 'Moustache', or 'Mustache' if you're in the US, is the hair that lives and grows above your Lips. There are many different styles that can be associated with the moustache, with the most popular style being the handlebar moustache. Your neckline is referred to the line that separates the lower limit of your beard and your neck. Normally the neckline is achieved by trimmer or shaving away the hairs that are below your defined neckline. How we define our neckline is normally measuring a virtual line between the point just below your earlobe and following it under your chin to the other side of your face. The line should meet on either side of the point below your earlobes, and an inch above your Adam's apple. You can see how to trim your neckline in detail here. Beard oil is probably the first item you'll buy for your beard. When we talk about oil for the beard, we talk about conditioning your skin underneath your beard and protecting the beard and moustache hair. 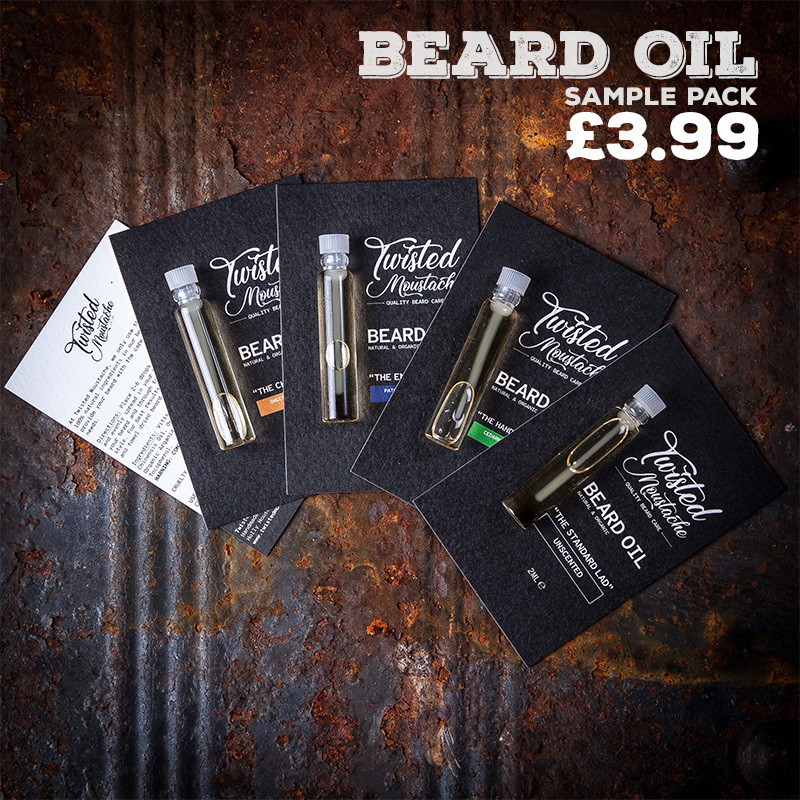 Beard oil is made up of two categories of oil. Carrier oils and essential oils. The carrier oils would make up the bulk of the product and some of the most popular carrier oils include Coconut oil, Almond oil, Argan oil and Jojoba oil. The essential oils give the oil a nice scent, with some of the popular scents being Cedarwood, Basil, Bergamot and Tea Tree. Pigment or pigmentation describes the colour of our hair follicles. The darker your natural hair colour is, the more individual hair follicles you'll have on your chin. A razor is an instrument or tool that has a sharp blade. You would normally use a razor to clean up and remove unwanted hair from your cheek line or neckline when you're rocking an awesome beard. This is basically a slang word referring to your beard or facial hair. Again just like the term 'front'. This is pretty obvious and it describes the hair that grows on your cheeks. Mainly all of the hair on your side is connected to your sideburns and moustache on that side. Your sideburns are generally known as the hair that grows in front of your ears. This hair is what connects your beard to the hair on your head. Who remembers those classic pointy mutton chop sideburns that Bert Reynolds was famous for? Now, this is a rare term that you don't hear that often. Have you ever wondered what that little patch of hair that grows under your bottom lip is? Yep, it's your soul patch. People tend to refer to all the hair under there as either a goatee or a full beard, but when you showcase this hair on its own, it's called the soul patch. Under no circumstances should ‘soul patches’ be grown above the top lip. This is asking for trouble. This is where your facial hair is very short and small stiff hairs appear usually after a day of not having a clean shave. The name stubble refers to the feel and texture of the beard, which resembles a stubbly feeling like soft sandpaper. Just another word for a moustache. A very annoying word that I get a lot. "Hey dude, check out your tache!" In the beard world, we generally use the word terminal hair as a way of measuring its thickness, which isn't correct. Terminal hairs are also known as full matured hair. These hairs are thick, pigmented and strong, the opposite of a terminal hair is called a vellus hair. Terminal length is what we describe the maximum length our beard hair will grow without treatment or cutting it. The terminal length of the different parts of your face could be, and generally are different. For example, the hair on your chin would normally have a greater terminal length than the hair below your bottom lip. Hair texture is a characteristic of hair and a measure of the circumference of the hair strand itself. Many professionals would classify hair texture as being either "fine", "medium" or "coarse". This alternately determines the type of heir you have e.g. curly, straight etc. A style of moustache that we will never get away with wearing anymore. Once rocked by the legend Charli Chaplin, not ruined by hitter forever! Sometimes guys who can't grow a beard, or they might have extream patchiness in their beard, they go for something called a beard transplant. In a nutshell, according to Wikipedia, Hair (beard) transplantation is a surgical technique that removes hair follicles from one part of the body to another part of the body. This called the 'donor' to 'receipt' process. My advice, before you go under the knife, try following my guide on how to grow your beard first. 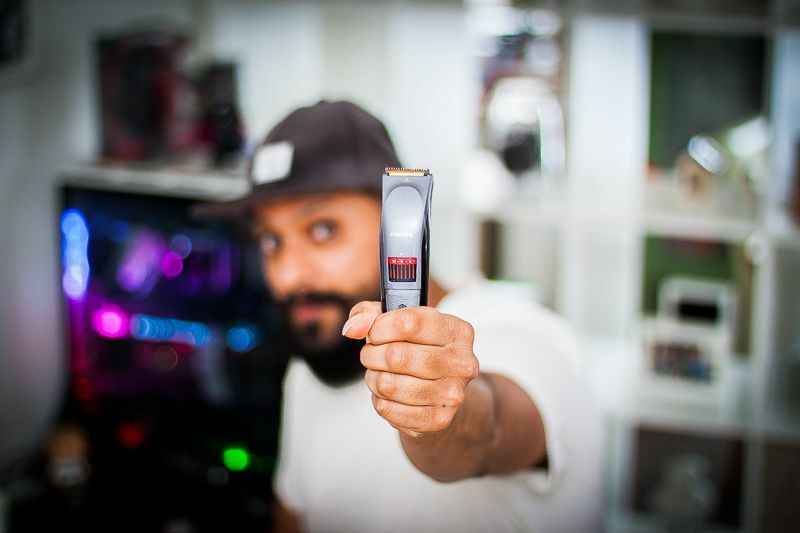 Very similar to a traditional clipper that you would kind in a barber shop, a beard trimmer is a trimming tool specially suited to your beard. It would come with different sizes of trimming guards to suit most beard lengths. Beard trimmers can come in various different styles and sizes. Some are big and wired, and some are compact, wireless and more expensive! If the yeard is one year, then the Tweard is?! Simply put a 'Tweard' is the process of growing your bead for two years. Not directly a beard term, but because it's used a lot together with a beard I've included it. An undercut describes a hairstyle that most believe to be the best style to suite lads with full beards. Typically, the undercut hair hairstyle is where the hair at the top of your head is long and either parted on either side or sometimes down the centre depending on your style preference. The sides are then trimmed very short, normally with some clippers. The Van Dyke is a beard style that combines the hair from your moustache and goatee. The name of this style was made famous by a painter named Anthony van Dyke. If you ever go for the Van Dyke, you would sport a small goatee and a small moustache, with everything else on your face completely shaved. Some say that you should follow the lines on your face and around the chin as much as possible to have a more defined look. The opposite of terminal hair would be Vellus. This type of hair is lighter and softer than terminal hair and most men tend to find they have more vellus hairs than others. Also, you might currently find that you have some blonde or lighter hairs in your beard or moustache than the rest, which is likely to also be thinner and softer. This is very common in lads that grow beards. Vellus is actually the first facial hair that grows during adolescence and is what terminal hair turns into. When you hear the word wax, you tend to think of moustache wax. Wax is used to give your moustache a mega hold. If you looking to grow a twisted moustache like the handlebar, then you would use wax to give you those curls at the end. Wax is also found in beard balm, as the qualities found in wax is also great for giving beard balm that great hold effect on your beard. Most products would use Beeswax. When we talk about whiskers for men's facial hair (Not for a cat), it's used to describe the hair on one's chin and cheeks. This is probably what a lot of lads are aiming for. They will be counting down the days. Yeard = Your beard after a year. It's also known as the one year beard. A lot of people document their beard growth all the way to their 'Yeard'. This was more of a reference than an article. I've tried to explain as many of the beard-related terms as possible. We've kept them in alphabetical order for easy finding. If you have any suggests please let me know and I'll add it to the list.